AIMS : Recent data have reported that neoatherosclerosis could develop long after stent implantation and lead to subsequent rupture and acute coronary syndrome (ACS). 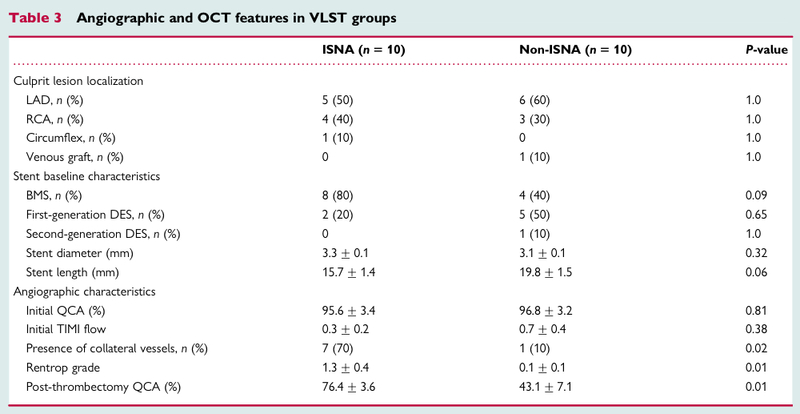 We sought to identify the presence of in-stent neoatheroma (ISNA) in patients with very late stent thrombosis (VLST) using optical coherence tomography (OCT). METHODS AND RESULTS : All patients from two catheterization centres who presented with ACS related to VLST underwent a standard coronary angiography and intra-coronary OCT. ISNA was defined as the combination of diffuse neointimal proliferation, lipid-laden intima with plaque organization, and fibrous cap rupture with no evidence of an uncovered strut. Out of 2139 ACS patients, 20 presented with definite VLST, including 10 with evidence of ISNA lesions, detected using OCT. 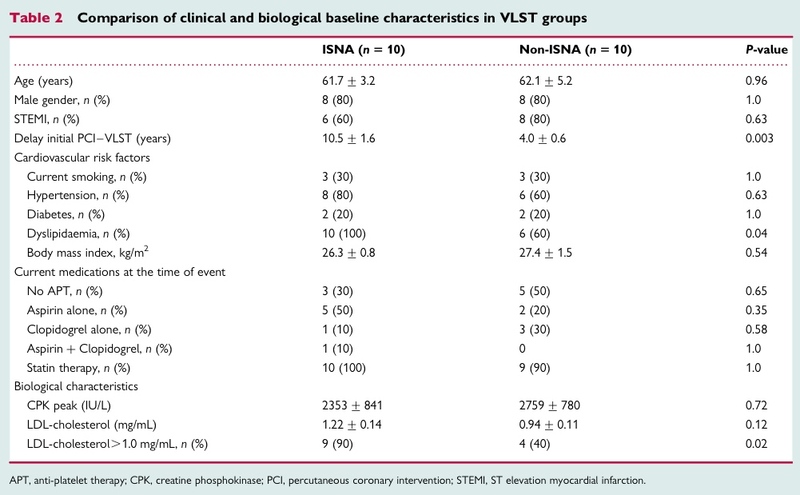 The mean delay between initial percutaneous coronary intervention and VLST was longer in the ISNA patients compared with non-ISNA patients (10.5 + 1.6 vs. 4.0 + 0.6 years, P 1⁄4 0.003). The mean LDL-cholesterol tended to be higher in ISNA patients compared with non-ISNA patients. OCT analysis revealed significantly thicker neointimal coverage as well as a lower number of uncovered struts in ISNA lesions compared with the other patients. LDL-cholesterol levels were correlated with the average neointima thickness (Spearman’s rho 1⁄4 0.46, P 1⁄4 0.04). All the ISNA lesions were treated through initial thrombectomy followed by redo stenting in nine patients. CONCLUSION : Our data show that ISNA is frequent in patients with VLST. These results suggest that OCT imaging is helpful in identifying the underlying mechanisms of VLST and, therefore, in the clinical decision-making process. Using OCT, we sought to investigate the incidence and characteristics of in-stent neoatherosclerotic (ISNA) lesions among a cohort of ‘real-world’ patients with VLST. Standard clinical and biological characteristics were established, including fasting LDL-cholesterol measurement. The creatine phosphokinase peak value was determined according to consecutive measurements on blood samples. The APT regimen of the patients, the date and type of stent implanted were retrospectively obtained by interviewing the cardiologists in charge of the patients. Our local Ethics Committee approved the study and informed consent was obtained. Two operators retrospectively reviewed coronary angiography and analysed pre- and post-thrombectomy culprit lesion characteristics, including the antegrade angiographic flow in the culprit vessel according to the Thrombolysis in myocardial infarction criteria, collateral filling of the culprit vessel according to the Rentrop classification,14 and calculation of the degree of stenosis (before and after thrombectomy) using a dedicated quantitative coronary angiography (QCA) software (Centricity CA1000/GE Healthcare, Buc, France). All procedures were performed through radial access. PCI was per- formed with a 6 Fr guiding catheter in all patients. A 0.014-inch guide wire was placed distally in the target vessel. Thrombo-aspiration was first performed using a manual thrombectomy device (Eliminate,TERUMO) in patients with initial TIMI flow <2 in order to obtain an antegrade TIMI flow= 3. Frequency domain (FD)-OCT images were then acquired with a commercially available system (C7 System; LightLab Imaging, Inc./St Jude Medical, Westford, MA, USA) after the OCT catheter (C7 Dragonfly; LightLab Imaging, Inc./St Jude Medical) was advanced to the distal end of the target lesion. The first FD-OCT run was conducted before either direct stent implant- ation or balloon predilatation (pre-PCI run). The entire length of the target area was scanned using the integrated automated pullback device at 20 mm/s. During image acquisition, the coronary blood flow was replaced by continuous flushing of contrast media directly from the guiding catheter at a rate of 4 mL/s with a power injector in order to create a virtually blood-free environment. After OCT imaging, the operator was given the choice between one of the following pre-defined strategies: (i) immediate culprit lesion stenting; (ii) immediate culprit lesion treatment with balloon angio- plasty alone; (iii) medical treatment with anticoagulant therapy and subsequent OCT control with ad hoc PCI. All the images were recorded digitally, stored and each frame (0.2 mm) read by two independent investigators, allowing systematic analysis at 1 mm intervals. Offline analysis was performed with proprietary soft- ware (Lightlab, Imaging, Inc./St Jude Medical) after confirming calibra- tion settings of the Z-offset. ISNA was recognized as the culprit lesion if the following criteria were fulfilled: (i) the presence of neoatherosclerotic tissue transform- ation within the stent; (ii) the presence of a neointimal rupture within the stent; (iii) the absence of uncovered struts; (iv) the absence of ruptured-cap atherosclerotic lesion proximal or distal to the stent. The patients included in the study were prospectively followed-up regarding adverse cardiovascular events. The clinical follow-up was carried out in clinic visits and/or through phone contact with all patients after hospital discharge. Cardiovascular adverse events were defined as cardiovascular death, non-fatal stroke, non-fatal myocardial infarction, and the need for urgent target vessel revascularization. Statistical analysis was performed with SPSS 16.0 (SPSS software, Chicago, IL, USA) software. Data are expressed as the mean and stand- ard error to the mean and the normality of their distribution was assessed by the Kolmogorov–Smirnov test. Categorical and continuous variables were compared using x2 or Fisher’s exact tests and Mann – Whitney U-tests, respectively. Quantitative variables with non- normal distribution were log-transformed and univariate correlations were assessed by Spearman’s rho test. A two-sided alpha level of 0.05 was used for all superiority testing. A total of 2139 patients with ACSs were admitted to both centres between October 2010 and November 2012. Twenty of these subjects (0.93%) presented a definite VLST. OCT imaging identified 10 subjects (50%) with evidence of ISNA lesions rupture without stent malapposition (Figure 1), whereas 10 patients had evidence of stent malapposition and/or incomplete neointimal coverage (non-ISNA group). There was full agreement between the two operators regarding VLST as the underlying cause. Clinical and lesion characteristics for each of the ISNA patients are provided in Table 1. Eighty per cent of the patients were male and STEMI was the initial clinical presentation in half of the cases. BMS were implanted in 80% of the cases and first generation DES in 20%. Ninety per cent of the subjects reported pre-infarction angina in the days before the acute event. The mean delay between index PCI and VLST ranged from 1.3 to 17.5 years (mean 1⁄4 7.5 + 1.1 years), highlighting the fact that VLST can occur 10 years after the initial procedure. Although most of the patients were taking aspirin and/or clopidogrel, 30% were under no APT at the time of the thrombotic event. The comparison between the characteristics of patients from the two VLST groups is given in Tables 2 and 3. We observed that the delay between the initial PCI and the thrombotic event was longer in ISNA patients than non-ISNA patients. Interestingly, we observed among patients with ISNA, a trend towards a shorter delay in patients with DES compared with BMS (4.9+1.2 vs. 11.9 + 1.6 years, P= 0.08). Furthermore, a history of dyslipidaemia was more frequent in the ISNA group and the mean baseline LDL-cholesterol value tended to be higher compared with the other group. There was no significant difference between the two groups regarding clinical presentation, APT regimen, stent type, or culprit lesion localization; however, we observed that the initial angiographic Rentrop grade was higher in the ISNA patients compared with the non-ISNA patients, suggesting a more progressive phenomenon. Finally, the degree of post- thrombectomy residual stenosis (as measured by QCA) was higher in the ISNA group than in the non-ISNA group. FIGURE 1 Examples of neoatherosclerosis related to VLST explored by OCT imaging with different timings. Case 1 (Patient #2; A and B): immediate intra-stent OCT analysis after successful manual thrombectomy. The images depicted the presence of heterogeneous tissue prolif- eration within the stent, lipid-laden intima with diffuse border, hypo-intense zones due to signal attenuation (A, white arrows) within the SA (delimited by the white arrowheads). No uncovered strut was seen but the presence of residual white thrombus was observed (B, white arrows). Case 2 (Patient #6; C and D): Deferred (15 days) OCT analysis after initial successful manual thrombectomy and initial antithrombotic therapy (abciximab + clopidogrel + aspirin). Two individualized thin fibrous cap lesions (C, white arrows) with lipidic content are visible among the thick neointimal proliferation within the SA (arrowheads). A ruptured fibrous cap was observed proximally (D, white arrows) connecting the lumen with the deterged core of the lesion (arrowheads). OCT measurements analysed n= 3394 struts (Table 4). We observed that the minimal intra-stent luminal area was significantly smaller in the ISNA group compared with the non-ISNA group, but there was no significant difference in minimal and average SA values among all patients. Furthermore, the average neointima area and neointima thickness per strut were significantly higher in the ISNA patients compared with the others. Finally, we observed a significant correlation between the average neointima area and LDL-cholesterol levels (Spearman’s rho1⁄40.46, P1⁄4 0.04; Figure 2). OCT analysis allowed us to provide the most appropriate therapy, according to VLST aetiology. All ISNA patients except one were treated with stent implantation within the original device. A DES was used in 90% of cases and one patient received a BMS because of a high-bleeding risk and contraindications for long-term dual APT. Among non-ISNA patients, a subsequent intra-stent non-compliant balloon angioplasty was performed in five patients and medical therapy alone was proposed in five patients. The clinical follow-up was successfully carried out in all patients (follow-up median time: 261 days/inter-quartile range: 203 days). One patient from the non-ISNA group died, from a fatal ventricular arrhythmia (control angiography revealed no stent thrombosis) 15 days after the initial STEMI. There was no major cardiovascular adverse event during the hospital-phase or after hospital discharge for the ISNA patients, suggesting that the treatment of these lesions with repeated stenting could represent an appropriate option. In this study, OCT imaging identified ISNA in half of the patients with VLST presenting as ACS. The present data illustrate that this phenomenon: (i) is frequent among VLST; (ii) can occur in both BMS and DES; and (iii) can occur very late after index PCI. Although VLST is a rare and uncommon complication of PCI, its consequences are severe and its pathophysiology is not fully understood. The presence of incomplete neointimal coverage has been identified as a major risk factor for stent thrombosis, including VLST.7,19 The uncovered struts favour platelet adhesion and facilitate the local clotting process.7 Other factors are suspected to be potential risk factors for LST and VLST, such as stenting of highly necrotic plaques, presence of a disrupted plaque or residual dissection ,2mm from stent extremities.7 Recently, autopsy and intra-coronary imaging data (including intra-vascular ultrasound, OCT or angioscopy) have identified the presence of neoatherosclerosis lesions within previously implanted DES and BMS.3,5,12,20 These lesions displayed plaque architecture with a lipid core, a fibrous cap and neovascularization5 as well as peri- strut inflammatory cell infiltration.3 Regarding this data, the potential involvement of ISNA plaque rupture in VLST pathophysiology has been questioned. Hence, Kang et al.12 analysed patients presenting with ACS related to DES restenosis using OCT imaging and observed thin fibrous cap rupture and thrombi in >75% of cases. Interestingly, the percentage of thin-cap rupture and the presence of thrombi increased over time and was higher in the DES implanted longer than 20 months compared with those implanted <20 months.12 However, this series excluded patients with angiographically proven stent thrombosis, which might have led to an underestimation of the true incidence of the phenomenon. Furthermore, Yamaji et al.21 identified 42 cases of BMS VLST and observed the presence of atherosclerosis debris (foamy macrophages, cholesterol crystal, fibrous cap) after manual thrombo-aspiration in 31% of cases, but in 39% of the patients with VLST occurring over 3 years after initial PCI. Comparable results were observed by Hou et al.11 who identified ruptured ISNA lesions in one-third of their patients with ACS due to BMS restenosis. Overall, these data suggest that ISNA is an entity with true involvement in DES and BMS failure, and thereby contributes to LST and VLST. In the present series based on ‘real-world’ patients with definite VLST according to ARC criteria, ISNA was observed in 50% of the cases, which is consistent with previous results. The mechanisms underlying ISNA formation are not yet clear. Inoue et al.22 reported that arteries exhibited endothelial coverage with smooth muscle cells and collagen-rich neointima that was infiltrated with inflammatory cells, 2–3 years after BMS implant- ation. This chronic inflammation occurred around the struts and evolved over time: in stents that had been in place >4 years, smooth muscle cells were sparse, with abundant collagen and evidence of foamy macrophages (expressing metalloproteinases).22 Nakazawa et al.3 made similar observations in both BMS and DES and suggested that the phenomenon progressed differently according to stent type: the lesion progression was faster in vessels treated with DES than in those treated with BMS. Interestingly, despite the limited size of our sample, we observed that the delay between index PCI and VLST tended to be shorter in ISNA patients with DES compared with those with BMS. All these results suggest that neointima formation occurring within metallic stent implants is prone to the same atherosclerotic phenomenon as that affecting native vessels. Whereas this phenomenon usually evolves over a period of 40 years in native vessels,23 our study showed a faster progression within the implanted stents (as witnessed by the delay ranging from 3 to 16 years after the initial procedure). The underlying chronic inflammation related to the presence of the stent could hasten neoatherosclerosis plaque formation and its evolution towards rupture. The observation of an ‘accelerated’ ISNA formation within DES compared with BMS has to be confirmed, but might be the result of an aggravated local inflammatory reaction or hypersensitivity related to the presence of the polymer or cytostatic drug.24 – 26 The regenerated endothelium present at the surface of the stent might also possibly be dysfunctional and favour the migration of lipids and inflammatory cells within the neointima, which would enhance ISNA formation.27 Interestingly, we have also noted that all our ISNA VLST patients still had LDL-cholesterol levels above the recommended target levels,28 suggesting that persistent hypercholesterolaemia despite statin therapy could, thus, have impacted ISNA pathogenesis. This latter hypothesis was also supported by the positive correlation we observed between the average neointima area and LDL-cholesterol values in our study population, but will need a larger group of patients to confirm this. Finally, these findings highlight the need for improved control of cardiovascular risk factors in secondary prevention situations. Several limitations of the study warrant consideration. First, our results are based on data collected from two catheterization centres and the sample size is small. This limited sample is related to the low frequency of VLST in the ACS population and our inclusion criteria, which only focused on angiographically proven definite VLST in both BMS and DES. Therefore, we might have underestimated the frequency of the phenomenon in the general population and the true incidence of ISNA within stents might be different. Our data might, thus, differ from the previously published results obtained in pathology specimens,3 in unstable patients without definite stent thrombosis12 or the results observed in thrombo-aspiration products without the use of any intra-vascular coronary imaging.21 The present series completes and broadens our knowledge of the topic by providing information through the analysis of an unselected group of patients. Nonetheless, further research in larger multicentre samples is warranted to comprehensively investigate the incidence, mechanisms, and risk factors of ISNA. The present data were collected by OCT analysis. Although this technique has an excellent spatial resolution and is appropriate for the detection of thin-cap fibroatheroma,14 it also has some drawbacks, including the signal attenuation caused by large amounts of red thrombus or very thick neointima that might obscure the underlying neointima morphology or stent struts. Hence, previous studies reported that thick neointima could result in an intra-stent multilayered aspect during the OCT analysis.29 These properties might explain why fewer struts were visualized in the ISNA patients (another possible explanation relies on the longer stent length in the non-ISNA group). Finally, our imaging analysis was not corroborated by the pathological analysis of thrombo aspiration debris, since this procedure was not routinely performed in our two centres. In summary, the current study shows that ISNA is frequent in an unselected population of ACS patients presenting with VLST. Furthermore, our data provide new insights on ISNA pathogenesis, as it shows a longer interval of occurrence from the index procedure to events in neoatherosclerosis compared with non-ISNA VLST, as well as a poorer control of dyslipidaemia in the ISNA subjects. Overall, these results suggest that OCT imaging is useful to: (i) identify the mechanisms underlying VLST; and (ii) help in the clinical decision-making process and lead to the optimal treatment of subjects with this complication (i.e. redo stenting in case of ISNA rupture vs. thrombectomy-antithrombotic management in non-ISNA patients). This particular point has to be investigated in future larger randomized trials. Conflict of interest: N.A., G.S., C.C., and P.M. received consult- ing fees from St Jude Medical. P.M. received consulting fees from Terumo. 1. Schatz RA, Palmaz JC, Tio FO, Garcia F, Garcia O, Reuter SR. Balloon-expandable intracoronary stents in the adult dog. Circulation 1987;76:450–7. 2. Weintraub WS. The pathophysiology and burden of restenosis. Am J Cardiol 2007; 100(Supp. 5):S3–9. 3. Nakazawa G, Otsuka F, Nakano M, Vorpahl M, Yazdani SK, Ladich E et al. The pathology of neoatherosclerosis in human coronary implants: bare-metal and drug-eluting stents. J Am Coll Cardiol 2011;57:1314 – 22. 4. Takano M, Yamamoto M, Mizuno M, Murakami D, Inami T, Kimata N et al. Late vascular responses from 2 to 4 years after implantation of sirolimus-eluting stents: serial observations by intracoronary optical coherence tomography. Circ Cardiovasc Interv 2010;3:476 – 83. 5. Takano M, Yamamoto M, Inami S, Murakami D, Ohba T, Seino Y et al. 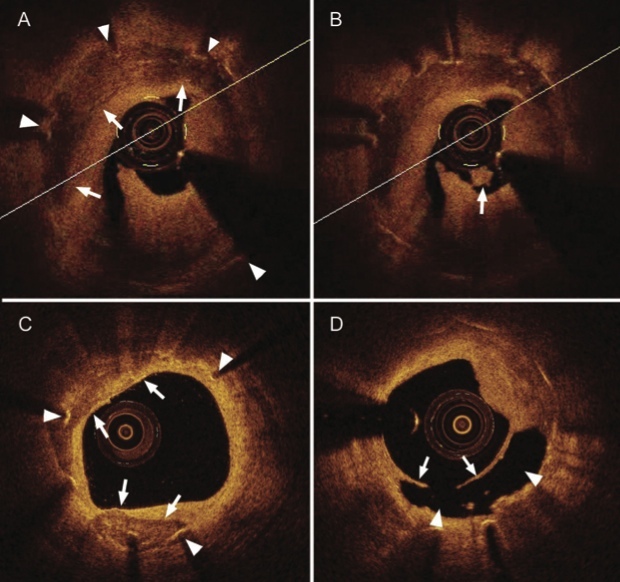 Appearance of lipid-laden intima and neovascularization after implantation of bare-metal stents extended late-phase observation by intracoronary optical coherence tomog- raphy. J Am Coll Cardiol 2010;55:26 – 32. 6. Cutlip DE, Windecker S, Mehran R, Boam A, Cohen DJ, van Es G-A et al. Clinical end points in coronary stent trials. Circulation 2007;115:2344 – 51. 7. Farb A, Burke AP, Kolodgie FD, Virmani R. Pathological mechanisms of fatal late coronary stent thrombosis in humans. Circulation 2003;108:1701 – 6. 8. Finn AV, Otsuka F. Neoatherosclerosis: a culprit in very late stent thrombosis. Circ Cardiovasc Interv 2012;5:6 – 9. 9. Gutierrez-Chico JL, Alegria-Barrero E, Teijeiro-Mestre R, Chan PH, Tsujioka H, de Silva R et al. Optical coherence tomography: from research to practice. Eur Heart J Cardiovasc Imaging 2012;13:370 – 84. 10. Yabushita H, Bouma BE, Houser SL, Aretz HT, Jang IK, Schlendorf KH et al. Char- acterization of human atherosclerosis by optical coherence tomography. Circula- tion 2002;106:1640 – 5. 11. Hou J, Qi H, Zhang M, Ma L, Liu H, Han Z et al. Development of lipid-rich plaque inside bare metal stent: possible mechanism of late stent thrombosis? An optical coherence tomography study. Heart 2010;96:1187 – 90. 12. Kang SJ, Mintz GS, Akasaka T, Park DW, Lee JY, Kim WJ et al. Optical coherence tomographic analysis of in-stent neoatherosclerosis after drug-eluting stent im- plantation. Circulation 2011;123:2954 – 63. 13. Authors/Task Force M, Van de Werf F, Bax J, Betriu A, Blomstrom-Lundqvist C, Crea F et al. Management of acute myocardial infarction in patients presenting with persistent ST-segment elevation: the Task Force on the management of ST-segment elevation acute myocardial infarction of the European Society of Car- diology. Eur Heart J 2008;29:2909 – 45. 14. Rentrop KP, Cohen M, Blanke H, Phillips RA. Changes in collateral channel filling immediately after controlled coronary artery occlusion by an angioplasty balloon in human subjects. J Am Coll Cardiol 1985;5:587–92. 15. Prati F, Guagliumi G, Mintz GS, Costa M, Regar E, Akasaka T et al. Expert review document part 2: methodology, terminology and clinical applications of optical coherence tomography for the assessment of interventional procedures. Eur Heart J 2012;33:2513–2520. 16. Gutierrez-Chico JL, Regar E, Nuesch E, Okamura T, Wykrzykowska J, di Mario C et al. Delayed coverage in malapposed and side-branch struts with respect to well-apposed struts in drug-eluting stents/clinical perspective. Circulation 2011; 124:612 – 23. 18. Prati F, Regar E, Mintz GS, Arbustini E, Di Mario C, Jang IK et al. Expert review document on methodology, terminology, and clinical applications of optical co- herence tomography: physical principles, methodology of image acquisition, and clinical application for assessment of coronary arteries and atherosclerosis. Eur Heart J 2010;31:401–15. 19. Guagliumi G, Sirbu V, Musumeci G, Gerber R, Biondi-Zoccai G, Ikejima H et al. Examination of the in vivo mechanisms of late drug-eluting stent thrombosis: find- ings from optical coherence tomography and intravascular ultrasound imaging. JACC: Cardiovasc Interv 2012;5:12–20. 20. Higo T, Ueda Y, Oyabu J, Okada K, Nishio M, Hirata A et al. Atherosclerotic and thrombogenic neointima formed over sirolimus drug-eluting stent: an angioscopic study. JACC: Cardiovasc Imaging 2009;2:616–24. 21. Yamaji K, Inoue K, Nakahashi T, Noguchi M, Domei T, Hyodo M et al. Bare metal stent thrombosis and in-stent neoatherosclerosis. Circ Cardiovas Interv 2012;5: 47–54. 22. Inoue K, Abe K, Ando K, Shirai S, Nishiyama K, Nakanishi M et al. Pathological analyses of long-term intracoronary Palmaz-Schatz stenting; is its efficacy perman- ent? Cardiovasc Pathol 2004;13:109 – 15. 23. Libby P, Ridker PM, Hansson GK. Progress and challenges in translating the biology of atherosclerosis. Nature 2011;473:317 – 25. 24. Inoue T, Croce K, Morooka T, Sakuma M, Node K, Simon DI. Vascular inflamma- tion and repair: implications for re-endothelialization, restenosis, and stent throm- bosis. J Am Coll Cardiol Intv 2011;4:1057 – 66. 25. Virmani R, Guagliumi G, Farb A, Musumeci G, Grieco N, Motta T et al. Localized hypersensitivity and late coronary thrombosis secondary to a sirolimus-eluting stent. Circulation 2004;109:701 – 5. 26. Stampfl U, Radeleff B, Sommer C, Stampfl S, Lopez-Benitez R, Thierjung H et al. Paclitaxel-induced arterial wall toxicity and inflammation: Part 2 long-term tissue response in a minipig model. J Vasc Interv Radiol 2009;20:1608 – 16. 27. Nakazawa G, Vorpahl M, Finn AV, Narula J, Virmani R. One step forward and two steps back with drug-eluting-stents: from preventing restenosis to causing late thrombosis and nouveau atherosclerosis. JACC Cardiovasc Imaging 2009;2:625 – 8. 28. Reiner Z, Catapano AL, De Backer G, Graham I, Taskinen MR, Wiklund O et al. ESC/EAS guidelines for the management of dyslipidaemias: the Task Force for the management of dyslipidaemias of the European Society of Cardiology (ESC) and the European Atherosclerosis Society (EAS). Eur Heart J 2011;32:1769 – 818. 29. Tanaka N, Terashima M, Rathore S, Itoh T, Habara M, Nasu K et al. Different pat- terns of vascular response between patients with or without diabetes mellitus after drug-eluting stent implantation: optical coherence tomographic analysis. JACC Cardiovasc Interv 2010;3:1074 – 79.